Cardiovascular cell therapy represents a promising field, with several approaches currently being tested. The advanced therapy medicinal product (ATMP) for the ongoing METHOD clinical study ("Bone marrow derived cell therapy in the stable phase of chronic ischemic heart disease") consists of fresh mononuclear cells (MNC) isolated from autologous bone marrow (BM) through density gradient centrifugation on standard Ficoll-Paque. Cells are tested for safety (sterility, endotoxin), identity/potency (cell count, CD45/CD34/CD133, viability) and purity (contaminant granulocytes and platelets). The aims of the present work were (1) to optimize the cell manufacturing process in order to reduce contaminants and (2) to implement additional assays in order to improve product characterization and evaluate product stability. BM-MNC were isolated by density gradient centrifugation on Ficoll-Paque. The following process parameters were optimized throughout the study: gradient medium density; gradient centrifugation speed and duration; washing conditions. Differential cell count was performed by an automated hematology cell analyzer. Immunophenotype and cell viability were determined by flow cytometry. Functional hematopoietic and mesenchymal precursors and cells with angiogenic potential were assessed by colony-forming assays, cell invasion capacity by a fluorimetric assay. Sterility was tested using an automated microbial detection system, endotoxin by a kinetic chromogenic Limulus amebocyte lysate test. T-test was used for statistical analysis. A new manufacturing method was set up, based on gradient centrifugation on low density Ficoll-Paque, followed by 2 washing steps, of which the second one at low speed. It led to significantly higher removal of contaminant granulocytes and platelets, improving product purity; the frequencies of CD34+ cells, CD133+ cells and functional hematopoietic and mesenchymal precursors were significantly increased. The process was successfully validated according to Good Manufacturing Practices. The resulting ATMP mainly consisted of viable MNC including CD34+ and CD133+ cell subsets (2.98% ± 1.90% and 0.83% ± 1.32%, respectively), CD184/CXCR4+ cells (34% ± 15%), CD34+/CD133+/CD309+ endothelial precursors (44 ± 21 in 106 total cells), cells with invasion capacity, functional hematopoietic and mesenchymal precursors, cells with angiogenic potential; it was stable for 20 hours at 10°C. The methodological optimization described here resulted in a significant improvement of ATMP quality, a crucial issue to clinical applications in cardiovascular cell therapy. Cardiovascular cell therapy represents a promising field, with several approaches currently being tested for the treatment of both heart disease and peripheral vascular diseases -. According to current European regulations -, cell-based products such as bone marrow (BM)-derived cells for cardiovascular applications are defined as advanced therapy medicinal products (ATMP) and must be prepared according to Good Manufacturing Practice (GMP) standards. In this context, the development and validation of properly designed cell manufacturing and testing methods , are of paramount importance for successful translational research. The manufacturing process has to be carefully defined and validated to ensure product consistency . A suitable Quality Control (QC) strategy has to be designed for every specific ATMP, aiming at evaluating its safety, identity, purity and potency -. Safety testing should encompass sterility and lack of endotoxin, at least. The identity test panel includes cell morphology and immunophenotype. These tests also provide information on ATMP purity, as they detect undesirable impurities such as contaminating cell types. Potency is defined as a measure of biological activity. A potency assay should be based on a defined biological effect closely related to the mechanism(s) responsible for the functional benefits . Cell viability is an important component of the potency of cell-based ATMP; however, additional parameters of biological activity should also be tested . Release specifications (i.e. acceptance criteria to be met by a product lot in order to be administered to a patient) need to be defined for safety, which is generally evaluated by assays described in European Pharmacopoeia (EP) (compendial assays), and for crucial parameters such as cell viability. For other parameters, mostly evaluated by non-compendial assays developed on a product-specific basis, data may be recorded for information only, at least during the initial phases of clinical development. Our Cell Therapy Unit, authorized since 2008 for the production of ATMP, is focused on development activities aimed at modifying research grade cell products to obtain high quality, clinical grade cell products. The ATMP for the ongoing METHOD study ("Bone marrow derived cell therapy in the stable phase of chronic ischemic heart disease")  (ClinicalTrials.gov Identifier: NCT01666132; initial feasibility phase: 8/10 patients treated) consists of fresh mononuclear cells (MNC) isolated from autologous BM by density gradient centrifugation; cells are formulated in 5% human serum albumin (HSA) and tested for safety (sterility, endotoxin), identity/potency (cell count, CD45/CD34/CD133, viability) and purity (evaluation of contaminant granulocytes (GRA) and platelets (PLT). The aims of the present work were (1) to optimize the manufacturing process in order to reduce contaminants; and (2) to set-up additional identity and potency assays in order to improve product characterization and evaluate product stability. These improvements were crucial to the upcoming second phase of the METHOD trial, as well as to planned clinical trials, such as the CIRCULATE study ("Bone Marrow Derived Cell Therapy in Peripheral Artery Disease") in patients with critical limb ischemia. They have been explicitly requested by Swiss regulatory authorities (Swissmedic). Iliac crest BM was harvested in the patients who had been enrolled in the clinical trials SWISS-AMI (ClinicalTrials.gov Identifier: NCT00355186) , and METHOD (ClinicalTrials.gov Identifier: NCT01666132)  (target BM volume: 50 mL and 110 mL, respectively). Due to limited availability of iliac crest BM samples, sternal BM (volume: 54 ± 20 mL; n = 71) collected during cardiac artery bypass grafting surgery was used for the majority of development experiments, as preliminary results demonstrated a close similarity of sternal and iliac crest BM with respect to most analytical parameters (data not shown). All patients signed informed consent for BM donation. To prevent clotting, 1 mL of a solution containing 1000 international units of heparin (Drossapharm AG, http://www.drossapharm.ch) was added to each 10 mL BM sample. The BM was filtered through a 100 μm cell strainer (BD Biosciences, http://www.bdbiosciences.com) and diluted 1:2 in Dulbecco Phosphate Buffered Saline without Ca2+ and Mg2+ (D-PBS) (LiStarFish, http://www.listarfish.it). MNC were isolated by density gradient centrifugation on Ficoll-Paque PREMIUM (GE Healthcare, http://www.gelifesciences.com), followed by washing in D-PBS; 5% HSA (CSL Behring AG, http://www.cslbehring.ch) was used as formulation medium, and filtration through a 70 μm cell strainer (BD Biosciences) was performed as final process step. Several process parameters were optimized throughout the present study: gradient medium density; gradient centrifugation speed and duration; washing conditions. The following density gradient media were used: Ficoll-Paque PREMIUM 1.077 (density: 1.077 g/L), thereafter indicated as standard Ficoll-Paque, and Ficoll-Paque PREMIUM 1.073 (density: 1.073 g/L), thereafter indicated as low density Ficoll-Paque. An automated hematology cell analyzer (ABX Micros 60, Horiba medical, http://www.horiba.com/medical) was used to determine total White Blood Cells (WBC), percentages of lymphocytes (LYM), monocytes (MON), GRA, PLT, and Hematocrit. MNC were calculated by adding up LYM and MON. The test was carried out according to EP . Immunophenotype (CD45 and CD34, Beckman Coulter, https://www.beckmancoulter.com; or Miltenyi Biotec, https://www.miltenyibiotec.com; CD133, Miltenyi Biotec; CD184/CXCR4: BD Biosciences) and cell viability (7-AAD, Beckman Coulter or PI, Miltenyi Biotec) were determined by flow cytometry (FC 500 System, Beckman Coulter or MACSQuant Analyzer, Miltenyi Biotec). The tests were run according to EP ,. Endothelial progenitor cells (EPC) were determined using a commercial kit ("EPC enrichment and enumeration kit", Miltenyi Biotec) specifically designed for the enumeration of circulating EPC from peripheral blood, cord blood, leukapheresis products, or EPC from BM, based on the expression of CD34, CD133 and CD309 (VEGFR-2/KDR). For the enumeration of hematopoietic stem cell precursors, cells were suspended in Methocult® H4034 (StemCell Technologies, http://www.stemcell.com), then seeded in 35 mm dishes (1–2 × 104 viable cells/dish) and incubated at 37°C, 5% CO2. After 14 days, plates were microscopically scored for the presence of colonies. The assay was carried out according to EP . For the enumeration of mesenchymal stem cell precursors, cells were suspended in Mesencult®-XF (StemCell Technologies), then seeded in 100 mm dishes (5 × 105, 1 × 106, 2 × 106 viable cells/dish) and incubated at 37°C, 5% CO2. After 14 days, plates were fixed with methanol (International VWR, https://ch.vwr.com), stained with Giemsa solution (Merck, http://www.merck.com) and scored for the presence of colonies. For the enumeration of angiogenic precursors, cells were suspended in Complete CFU-Hill medium (StemCell Technologies), then seeded in fibronectin-coated 6-well plates (BD Biosciences) at 5 × 106 viable cells/well, and incubated at 37°C, 5% CO2. After 2 days, non-adherent cells were collected, transferred onto fibronectin-coated 24-well plates (106 viable cells/well) and incubated for 5 days. The wells were then fixed with methanol (International VWR), stained with Giemsa solution (Merck) and scored for the presence of colonies. The test was carried out according to EP  using an automated microbial detection system (BacT/ALERT® 3D, bioMérieux,, http://www.biomerieux.com). Results were released not less than 7 days after sample inoculum. This test was carried out according to EP  with a chromogenic technique using a synthetic peptide-chromogenic substrate complex cleaved by the reaction of endotoxins with Limulus amebocyte lysate. The endosafe®-PTS™ system (Charles River, http://www.criver.com) was used. Statistical analysis was performed with the two-tailed unpaired or paired t-test (Microsoft Excel software), as indicated in the text. The BM-MNC manufacturing method currently used in the ongoing feasibility phase of the METHOD trial  is based on density gradient centrifugation (719 × g, 20' at 20°C) on standard Ficoll-Paque (1.077 g/L), followed by 3 washing steps (582 × g, 10' at 4°C). The resulting product is composed of WBC with morphological characteristics of LYM (mean value ± standard deviation (SD)), 53% ± 16%), MON (15% ± 4%), and GRA (32% ± 18%) (n = 8). The PLT/WBC ratio is 4 ± 2. The MNC fraction comprising LYM and MON is considered the active fraction, whereas GRA and PLT represent impurities. For all 8 clinical lots produced so far, the levels of impurities were in compliance with product release specifications (GRA ≤ 75%, PLT/WBC ≤ 40; see below). Nonetheless, minimization of such impurities is desirable. Thus, development experiments were initiated to optimize the BM-MNC manufacturing process. Preliminary tests performed on a limited number of samples indicated that gradient centrifugation parameters (relative centrifugation force and duration) may not affect process performance in terms of impurity clearance or cell yield (Table 1); however, changing the gradient medium may improve GRA removal (Table 2), while adding a low-speed washing step may improve PLT removal efficiency, with no negative impact on product potency (Table 3). Five sternal bone marrow samples were processed in parallel with the same gradient medium but using different centrifugation parameters, as indicated. Data are reported as mean ± standard deviation. No statistically significant differences were detected (p > 0.05, paired T-test). PLT: Platelets; GRA: Granulocytes; MNC: Mononuclear cells (lymphocytes +μmonocytes). Five sternal bone marrow samples were processed in parallel using the same centrifugation parameters but different gradient media, as indicated. Data are reported as mean ± standard deviation. *p < 0.05; **p < 0.01, paired T-test. Mononuclear cells were isolated from 14 bone marrow samples through density gradient on standard or low density Ficoll-Paque, then washed in Dulbecco's phosphate buffered saline without Ca2+ and Mg2+; for the last washing step, each sample was divided in 2 aliquots that were centrifuged in parallel at 400 ± g and 100 ± g, as indicated. PLT: Platelets; MNC: Mononuclear cells (lymphocytes +μmonocytes); CFC: Colony Forming Cells; CFU-F: Colony Forming Units-Fibroblast. Data are reported as mean ± standard deviation. *p < 0.05; **p < 0.01, paired T-test. CFC assay was performed on 8 product batches only, CFU-F and Invasion assays on 4 product batches only. Based on such initial results, a new manufacturing method was designed, relying on the use of low-density Ficoll-Paque (1.073 g/L) as the gradient medium. The gradient step (400 × g, 30' at 20°C) was followed by 2 washing steps at 20°C, of which the second one was performed at low speed (washing #1: 400 × g; #2: 100 × g) in order to reduce the possibility that PLT may sediment together with MNC and be recovered in the cell pellet. The new manufacturing method was compared with the previous one in terms of overall efficiency (Table 4). It resulted in significantly improved removal of contaminant PLT and GRA (p < 0.01). On the other hand, the MNC yield was diminished. Data are reported as mean ± standard deviation. ailiac crest samples (n = 33) + sternal samples (n = 10); bsternal samples only; **p < 0.01 (unpaired T-test). The new processing method resulted in improved product purity (Table 5): MNC were significantly increased (p < 0.01), mainly due to an increased MON fraction, whereas contaminant GRA were significantly reduced (p < 0.01). The mean PLT/WBC ratio was not significantly affected (p > 0.05); however, its variability was drastically reduced. Data are reported as mean + standard deviation (range). MNC: Mononuclear cells (lymphocytes +μmonocytes); PLT: Platelets; WBC: White Blood Cells. ailiac crest (n = 33) and sternal (n = 10) bone marrow samples; bsternal samples only; **p < 0.01 (unpaired T-test). Such results allowed us to update product release specifications for crucial identity/purity parameters, as summarized in Table 6. The new specifications were set on the basis of results observed during process development (reported in Table 5, bottom line). The highest acceptable values of LYM and MON were defined considering the corresponding experimental mean values minus 2 SD. The highest acceptable values of GRA and PLT/WBC were defined based on the corresponding experimental mean values plus 2 SD. PLT: Platelets; WBC: White Blood Cells. All the characterization results obtained on product lots manufactured during process development according to the new method (Table 7; n = 20) were in compliance with the new specifications. WBC: White Blood Cells; PLT: Platelets; RBC: Red Blood Cells; EPC: Endothelial Progenitor Cells; CFC: Colony Forming Cells; CFU-F: Colony Forming Units-Fibroblasts; CFU-EC: Colony Forming Units-Endothelial Cells; FIO: For information only. The new manufacturing method led to significantly higher percentages (p < 0.01) of CD34 and CD133 expressing cells (Figure 1A), accounting for 2.98% ± 1.90% and 0.83% ± 1.32% of cells, respectively, in the new ATMP (Table 7; n = 18). Among CD34+ cells, 53% ± 10% were CD133+ (n = 8), in agreement with data reported for adult BM . The product also contained a consistent fraction (34% ± 15%; n = 18) of cells expressing CD184/CXCR4, the receptor for stromal cell-derived factor-1 (SDF-1), a functional marker of BM-MNC . CD34+/CD133+/CD309+ EPC (Table 7) accounted for 0.004% of WBC (44 ± 21 cells in 106 total cells). Release specifications were not defined for the immunophenotype-specific parameters; data are collected for information only. New manufacturing method: improved product immunophenotype and potency. Sternal bone marrow samples were processed according to the current or the new manufacturing method, as indicated, then tested as follows: (A) Immunophenotype, to detect CD34+ and CD133+ stem cells. (B) Colony Forming Cell assay (CFC), to detect hematopoietic precursor cells. (C) Colony Forming Unit-Fibroblast assay (CFU-F), to detect mesenchymal precursor cells. (D) Invasion assay, to detect cells with invasion capacity. Data are expressed as mean values; error bars represent standard deviations; *p < 0.05; **p < 0.01, unpaired T-test. The product potency was evaluated by assessing cell viability, invasion capacity and presence of functional hematopoietic precursors, mesenchymal precursors, and cells with angiogenic potential using CFC, CFU-F, and CFU-EC assays, respectively. The new manufacturing method significantly improved product potency in terms of functional hematopoietic (CFC, Figure 1B; p < 0.01) and mesenchymal precursors (CFU-F, Figure 1C; p < 0.01), but not invasion capacity (Figure 1D; p > 0.05). The new ATMP (Table 7) was characterized by high cell viability (90% ± 5%), well above the 70% specification, which is considered the minimum acceptable value for cell therapy products . It contained hematopoietic progenitor cells (CFC, 6 998 ± 4 363 colonies/106 cells), mesenchymal progenitor cells (CFU-F, 56 ± 40 colonies/106 cells), cells with angiogenic potential (CFU-EC, 31 ± 19 colonies/106 cells) and cells with invasion capacity (invasion index 47% ± 18%); no specifications were defined for such parameters. The new manufacturing method was validated by performing three production runs and testing the resulting BM-MNC preparations as summarized in Table 8. Three independent BM samples (100 ± 26 mL) were processed according to GMP in the classified area dedicated to sterile manufacturing, giving rise to 3 BM-MNC lots (18.5 ± 0.1 mL) that were tested in the GMP QC area. Defined specifications were in place for safety (sterility, bacterial endotoxins), identity/purity (LYM, MON, GRA, PLT/WBC, Hematocrit), and cell viability. The corresponding analytical methods were validated according to GMP for appropriate characteristics including specificity, repeatability, and intermediate precision ,. For the three BM-MNC lots, results of all of these tests complied with specifications (Table 8). EU: Endotoxin Units; WBC: White Blood Cells; PLT: Platelets; CFC: Colony Forming Cells; CFU-F: Colony Forming Units-Fibroblasts; FIO: For information only. The process guaranteed product sterility, absence of bacterial endotoxins, consistent appearance, integrity of the primary containers, and consistent product purity. GRA (15-27%) were well below the new highest acceptable value (55%) and the PLT/WBC ratio (5-6) was within the new specification (≤10). The product mainly consisted of MNC (73-85%) and contained cells expressing CD34 (2.94-8.95%) and CD133 (1.42-4.25%). Cell viability was 74-99%. In terms of potency, the product showed detectable functional hematopoietic (CFC) and mesenchymal (CFU-F) precursors as well as cells with invasion capacity. In summary, validation results were consistent with those obtained during product development and characterization. Accordingly, we considered that the new manufacturing process was successfully validated for safety, purity, identity and potency aspects. In order to define product shelf-life, a real-time stability study was performed at 10°C, previously identified in our lab as the optimal storage temperature for fresh BM-MNC (data not shown). A practical approach was used: stability specifications corresponded to release specifications (sterility: absence of bacterial growth, endotoxin ≤ 5.0 EU/ml, cell viability ≥ 70%, LYM ≥ 30%, MON ≥ 8%, GRA ≤ 75%, hematocrit ≤ 3.0). The stability study was also extended to functional parameters not yet subjected to release specifications. As additional stability criteria, the maximum decrease of each parameter relative to the corresponding baseline value was set at 25% (i.e. relative value ≤ 75%, see Figure 2). All the cell batches tested were in compliance with stability specifications for at least 20 hours (data not shown). For all parameters, differences between results obtained at baseline, 20 hours, and 24 hours were not significant. 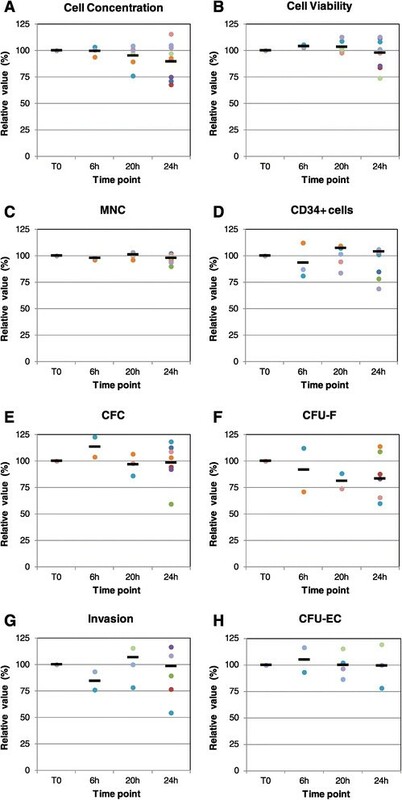 Relative values remained ≤75% of baseline until 20 hours for cell concentration (Figure 2A), viability (Figure 2B), MNC (Figure 2C), CD34+ cells (Figure 2D), CFC (Figure 2E), invasion (Figure 2G) and CFU-EC (Figure 2H), whereas some CFU-F values were between 50 and 75% (Figure 2F). According to these results, the product shelf life was set at 20 hours. Product stability. Nine sternal bone marrow samples were processed according to the new manufacturing method. The resulting product batches entered a stability program: they were stored at 10°C, and tested at 0-6-20-24 hours, for the following parameters: (A) Cell concentration. (B) Cell viability. (C) Percentage of mononuclear cells (MNC) (lymphocytes +μmonocytes). (D) Percentage of CD34+ cells. (E) Colony Forming Cell assay (CFC), to detect hematopoietic precursor cells. (F) Colony Forming Unit-Fibroblast assay (CFU-F), to detect mesenchymal precursor cells. (G) Invasion assay, to detect cells with invasion capacity. (H) Colony Forming Unit-Endothelial Cell assay (CFU-EC), to detect cells with angiogenic potential Data are expressed as relative values in respect to time 0. Each dot represents a single batch (identified by a distinct color), while black dashes indicate mean values. Relative value % = value at the indicated time point − value at time 0 value at time 0 x 100 . This work focused on the development and validation of a novel GMP manufacturing and testing strategy for BM-MNC as ATMP for cardiovascular cell therapy. Our goals were (1) to optimize the process in order to reduce contaminant GRA and PLT, and (2) to set-up additional identity and potency assays in order to better characterize the cell product and evaluate its stability. In our product, the MNC fraction comprising LYM and MON is considered the active component, whereas PLT and GRA represent impurities. The role of PLT within a cell therapy product is controversial, presumably due to their complex biology: they may exert potential beneficial effects on cell engraftment and tissue regeneration , but also negative effects. For example, in the context of the REPAIR-AMI trial, the number of contaminating PLT in the BM-MNC product was reported to inversely correlate with LVEF recovery in patients after cell therapy, even though this negative effect of PLT was less pronounced than that of contaminant RBC; on the contrary, contaminant neutrophils had no significant impact . Regardless of the therapeutic effect, BM-MNC purity is an important parameter with respect to the interpretation of the results of clinical trials. Increasing the product purity has been also specifically requested by regulatory authorities. The majority of development experiments were performed using sternal BM samples, harvested from patients undergoing cardiac surgery involving sternotomy. Such samples, showing a close similarity to iliac crest samples with respect to most analytical parameters, were more easily available in our clinical context with respect to iliac crest BM. The previous manufacturing protocol used in the initial phase of the METHOD study  and in the 'swiss multicenter intracoronary stem cells study in acute myocardial infarction clinical trial" (SWISS-AMI) , was derived from prior studies  with minor modifications. The new BM-MNC manufacturing protocol relies on the use of a low-density variant of Ficoll-Paque, i. e. Ficoll-Paque PREMIUM 1.073, which was selected based on previous evidence that BM-MNC isolated by Ficoll-Paque with different densities may differ in composition . In agreement with Grisendi et al. , we observed that low-density Ficoll-Paque leads to cells with higher mesenchymal stem cell clonogenic potential compared to standard Ficoll-Paque (Figure 1C). However, those authors reported a similar recovery of total nucleated cells for the two media, whereas in our hands the MNC yield was significantly reduced using the new protocol (Table 4), presumably due to the effect of low-density Ficoll-Paque (Table 2). Nevertheless, this limitation is offset by several advantages including higher purity (Table 5) and higher content of hematopoietic and mesenchymal precursors in cell products manufactured with the new method (Figure 1). Unlike Grisendi et al. , we evaluated additional methodological aspects besides the gradient medium. Gradient centrifugation parameters were adjusted (from 719 × g, 20' at 20°C to 400 × g, 30' at 20°C) to better adhere to the Ficoll-Paque manufacturer's instructions; such adjustment itself had no impact on overall process performance (Table 1). The washing procedure was also modified (from three washing steps at 582 × g, 10' at 4°C, to two washing steps at 400 × g and 100 × g, respectively, both at 20°C), on the basis of Ficoll-Paque manufacturer's indications suggesting two centrifugations, one of which may be performed at low speed to improve PLT removal. In our hands, the use of a low-speed centrifugation step indeed contributed to PLT abatement, even though it further reduced MNC yield (Table 3). The filtration steps were not optimized as they do not affect process performance (data not shown). The purpose of the initial filtration (100 μm) is to remove cell clumps or BM tissue fragments that could interfere with subsequent process steps, while the goal of the final filtration (70 μm) is to withdraw possible cell aggregates from the final product. Overall, the new method significantly ameliorated product quality. With respect to the QC strategy applied in most previous BM-MNC cardiovascular cell therapy studies ,,, our approach is more stringent in terms of safety, as in those studies cells were tested for sterility/microbiological contamination - but not for endotoxin. Endotoxin testing is important because high endotoxin levels as a result of bacterial contamination and/or improper quality of manufacturing materials and reagents cannot be ruled out a priori. Moreover, this is the only safety test which yields results before fresh product infusion, since microbiological assays take 7 days or longer. The specification for endotoxin (<5 Endotoxin Units/mL) has been set according to EP . Cell viability was evaluated in most trials ,,,,- and defined release criteria were reported by some authors, e.g. > 70% viable cells in the FOCUS-CCTRN trial , and > 80% in the REPAIR-AMI trial . In our case, the specification was set at ≥ 70% in accordance to recent FDA guidelines . Cell immunophenotype (mainly CD45 and CD34) was analyzed in most previous studies -,,,-, even though no release specifications were reported. We extended the immunophenotypic analysis to include not only CD133, a stem cell marker expressed by a subset of CD34+ cells , but also CD184/CXCR4 (SDF-1 receptor), a marker of functional BM-MNC activity. Seeger et al. reported that injection of CXCR4+ BM-MNC in mice with hindlimb ischemia significantly improved the recovery of perfusion compared to injection of CXCR4-negative BM-MNC; likewise, capillary density was significantly increased in mice treated with CXCR4+ BM-MNC. The higher migratory capacity of such cells and the release of paracrine factors may have contributed to tissue repair . A correlation between in vitro cell potency and long term clinical outcome has been recently shown for BM-MNC therapy of acute myocardial infarction . In the present study, the presence of CD34+ CD133+ CD309+ EPC  was evaluated on representative BM-MNC batches (Table 7, n = 5); however, it is not part of the QC release panel due to the limited number of available cells in clinical batches and the relatively high cell number required for this analysis. In terms of functional cell characterization, we included in QC release panel colony-forming assays for both hematopoietic (CFC) and mesenchymal precursors (CFU-F), along with testing of invasion capacity, which were assessed in the REPAIR-AMI study  and, in part, in the PROVASA study . In addition, we performed the CFU-EC assay to detect "angiogenic cells" . In previous studies, limited data on cell characteristics may have hampered the assessment of critical cell product parameters. The poor product characterization also limited the evaluation of product comparability among cardiovascular cell therapy studies, thus contributing to variable clinical results . It is well known that BM-MNC isolated through density gradient consist of a mixture of various cell subsets with different phenotype and function ,, including progenitor/stem cells such as hematopoietic stem cells, mesenchymal stem cells, EPC, multipotent adult mesenchymal progenitors and embryonic-like stem cells. The cell subsets responsible for beneficial effects of total BM-MNC in several clinical studies are not yet identified ,. It is also unknown whether selected BM-derived cell subpopulations may be superior to unfractionated BM populations containing a mixture of differentiated and less differentiated cells, potentially enhancing their effect by cross-talking with each other . Based on these considerations, our immunophenotypic and functional analysis of clinical grade BM-MNC may well contribute to the identification of product characteristics having impact on the clinical outcome in different patient populations, thus facilitating the identification of product critical quality attributes and the definition of release specifications for further clinical studies . The last part of our work focused on product stability, an issue particularly relevant in the case when a freshly-derived cell product is delivered to the patient. Due to the peculiar nature of the product (live cells, intrinsic inter-batch variability due to differences among patients, limited product availability), the stability study was performed at the storage temperature only (10 ± 5°C), as accelerated and stressed conditions recommended in general stability guidelines , were considered not applicable for viable cells. Both release parameters and characterization parameters not yet subjected to release specifications were evaluated within the context of stability testing (Figure 2). Overall, the results suggested that the product shelf-life could be set at 20 hours. This time frame abundantly covers the time necessary for the release of the product: pre-infusion testing (endotoxin, cell concentration, cell viability, immunophenotype) generally requires approximately 2 hours, or 4 hours in case of retesting due to deviations or non-conformities; the remaining 16 hours may cover the transport to the clinical site and/or infusion delay due to clinical issues. A limitation of the present study is the lack of in vivo experiments to demonstrate the superiority of BM-MNC manufactured according to the new protocol in terms of therapeutic potential. It could be interesting to address this issue in future pre-clinical studies, in animal models of hind limb ischemia or myocardial infarction. Principles detailed in Swiss and European regulations for ATMP -, as well as in the applicable European Medicinal Agency guidelines  and GMP guidelines , were taken into consideration throughout our development work. This approach allowed us to fulfil requests formulated by the competent regulatory authorities in view of the upcoming second phase of the METHOD trial  and of the new CIRCULATE study. Based on the results summarized here, included in the quality section of Investigational Medicinal Product Dossier, the CIRCULATE clinical trial was successfully submitted and recently got authorization. Methods for BM-MNC production and testing have been optimized and validated according to GMP. In particular, the manufacturing process has been redesigned, resulting in higher product purity and activity. Additional identity and potency assays have been set up in order to extend product characterization and evaluate product stability: an extended QC panel has been established, encompassing safety, identity/purity, and potency. Release specifications have been updated and product shelf-life has been defined based on experimental results obtained during development and GMP validation. The present work represents an example of constructive cooperation between a cell therapy manufacturing site and regulatory authorities, whose valuable inputs have been considered during product development. MR conceived and designed the study, carried out experiments, acquired/analyzed/interpreted data, performed statistical analysis, and drafted the manuscript; VLC carried out experiments, acquired/analyzed/interpreted process and QC data, and revised the manuscript; SS and SB carried out experiments and acquired/analyzed/interpreted QC data; DS provided study material, discussed data, and revised the manuscript; TT provided study material; FS provided study material; TM discussed data and revised the manuscript; GV discussed data and revised the manuscript; LT conceived and designed the study, carried out experiments, acquired/analyzed/interpreted data, and revised the manuscript. All authors read and approved the final manuscript. This work was supported by Fondazione Cardiocentro Ticino, Lugano, Switzerland.